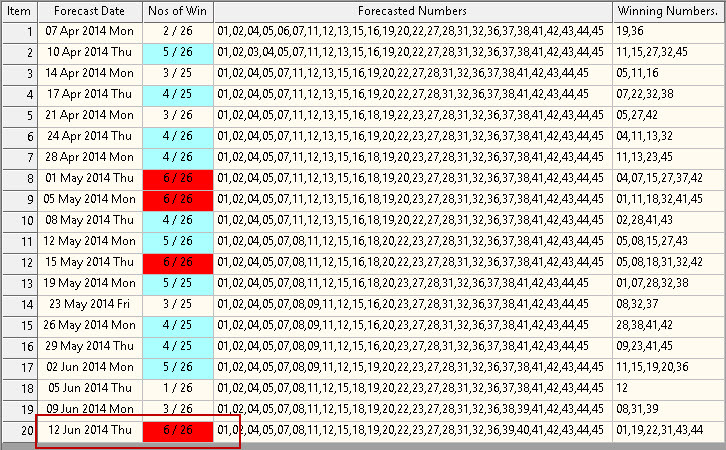 Yes, our WinTOTO Advance forecasted the 5+1 numbers for the game on 16 June TOTO game. The forecast method is Position method. If you using our wheeler correctly, the chances of hitting this prize is very high. Our special pooling also uses this forecast numbers. Like how HaiTong has been sharing in his TOTO video, he used all the numbers forecasted and chose 2 Keys. Using the DIY template "Win 7 guarantee 6" to generate system 7 tickets. 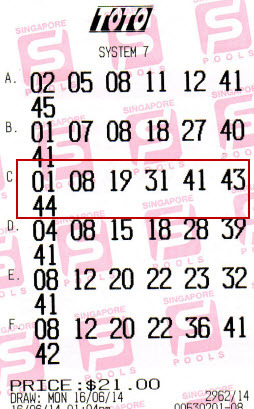 As for our play, unfortunately the key numbers he selected didn't matches, yet we still managed to hit the 4+1 prize. Imaging what if the keys is correct, the winning amount would be a lot more. Join us in our special TOTO pooling whenever the Jackpot prize reaches $1.5 Millions dollars. Call 92300837 to join.